Those who attended the recent old boys’ dinner at the Marine Court Hotel will know that a favourite topic for conversation among past pupils, particularly those who were at the school in the early 1970s, involved an episode in September 1973 when the Headmaster sent home almost the entire Sixth Form because their hair was too long. The unfolding story attracted the attention of not only the local County Down Spectator, but also the Belfast Telegraph and News Letter, plus BBC Northern Ireland and Ulster Television, with both TV stations dispatching camera crews and reporters to College Avenue. When they were refused permission to enter school property to conduct interviews with some of the rebellious students, they headed to the playing fields at Ballymacormick, where no such restriction applied. By a remarkable coincidence, one of those television reports, albeit recorded on an audio (cassette) tape, turned up very recently when Grammarians chairman Terence Bowman was instructed (ordered?) by his wife to clear out some 40 years of accumulated bits and pieces – some might say junk – from the roof space. The original UTV broadcast, from 12 September 1973, with David Dunseith in the studio and reporter Colin Baker conducting the interviews, no longer exists, which means this is very likely the only surviving copy – and it hasn’t been heard in some 45 years. As regards the episode itself, a Monday deadline was imposed by Headmaster Randall Clarke after the summer break and while a number of the boys obeyed the instruction to visit the barbers the whole of the Sixth Form was ordered to wait behind after Assembly after it expired. As one boy told the Spectator: “We stood in rows and were summoned forth in alphabetical order, prison camp style, to have our haircuts examined.” Some of the boys, who had previously passed an inspection following several haircuts, were ordered home, along with many more whose hair had been deemed all right in the first place. Some boys were sent home as many as three or four times before they finally passed the inspection. Of course in time the row blew over and an uneasy peace was restored. But there was another aspect to the whole affair that merits consideration more than 45 years later. During September 1973 there were 11 murders in Northern Ireland, including two teenagers, a milk lorry driver and a UDA leader in the days leading up to and at the time of the haircuts episode. One of the more horrendous murders of that era, and by all accounts unrelated to the Troubles, involved a little boy whose mutilated body was discovered a matter of hours before Randall Clarke launched his purge on the Sixth Form. Add to that another 12 people who were injured in a series of bomb attacks on London railway stations. 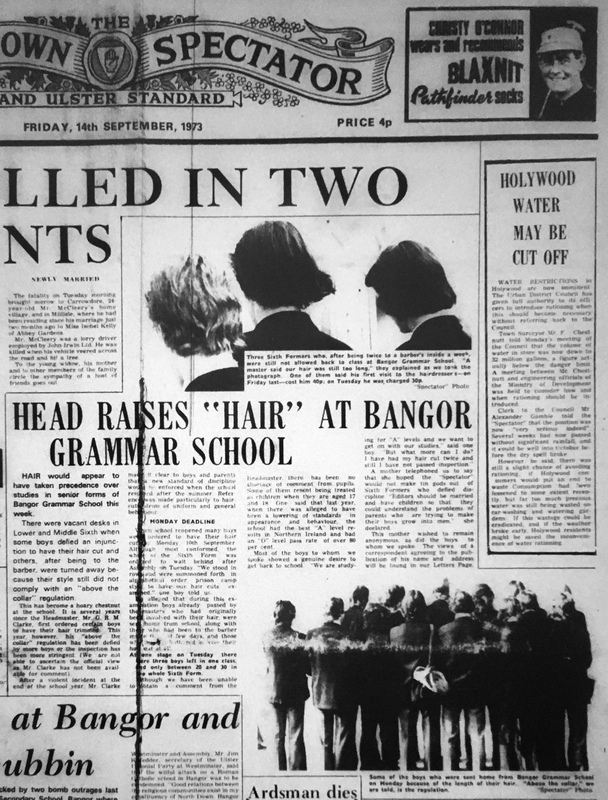 The people of Northern Ireland needed some light relief from a time of extreme violence and fear in the community – and it was the Sixth Form of Bangor Grammar School who, without realising it at the time, provided the offbeat story that seized the public’s attention. As a result it could be said they played a small but important place in the troubled history of Northern Ireland.